This book begins by giving a history of the Foley Potteries, then continues by identifying Wileman china between 1882 and 1910, including japan patterns and shapes. The final section documents earthenware ranges, listing many patterns. Backstamps, registered numbers, china and earthenware quick reference guides and a bibliography are contained in the appendices. The 150 pages of this A4 publication are liberally illustrated with colour pictures. 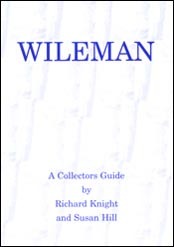 This book is a must for any Wileman collector.